alaTest has collected and analyzed 23 reviews of Panasonic Toughpad FZ-M1. The average rating for this product is 4.0/5, compared to an average rating of 4.5/5 for other products in the same category for all reviews. Reviewers are impressed by the portability and screen. The design and performance also get good comments, whereas some have doubts about the usability and price. We analyzed user and expert ratings, product age and more factors. Compared to other products in the same category the Panasonic Toughpad FZ-M1 is awarded an overall alaScore™ of 90/100 = Excellent quality. The Panasonic Toughpad FZ-M1 is tough as nails and built like a tank, but this rugged tablet is small enough to fit in a coat pocket. Low-resolution display. Short battery life. Runs hot; Mediocre performance ; The Panasonic Toughpad FZ-M1 tablet offers a highly configurable chassis and military-grade durability to withstand abuse even in extreme environments. The Panasonic Toughpad FZ-M1 tablet offers a highly configurable chassis and military-grade durability to withstand abuse even in extreme environments. Takes a licking. 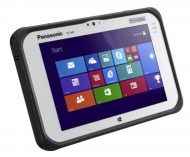 Panasonic's Toughpad FZ-M1 is an extremely robust 7-inch Windows 8.1 tablet. The Core i5 processor is cooled passively, which prevents continuous top-notch performance. If you're looking for a small-form-factor rugged Windows 8.1 tablet that's relatively compact and lightweight, Panasonic's 7-inch, 540g, 18mm-thick Toughpad FZ-M1 is a good option. It's expensive, though, and battery life could be better. For tablets destined to take the field, Panasonic proves a tough partner.